Waterbury Button Co. Brass US Army Military Jacket Button, Great Seal Design, General Service. Original buttons for the front of the service coat. 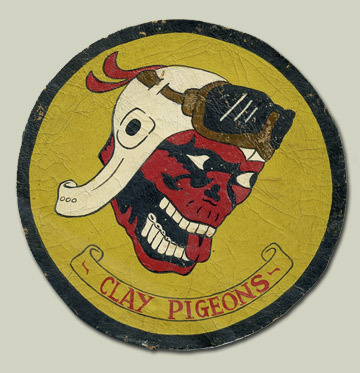 367th Squadron, 306th Bombardment Group, 8th Army Air Force leather patches. 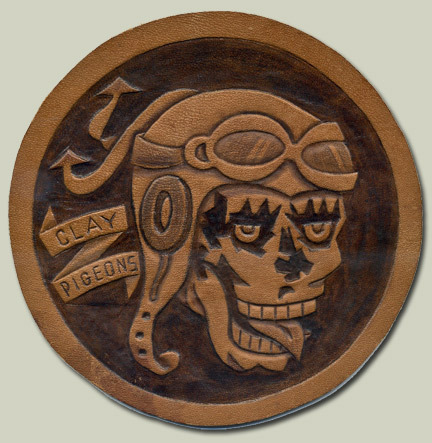 They were called the Red ape/Skulls and by the call sign "Clay Pigeons." Dubbed the Clay Pigeons by a Saturday Evening Post correspondent, because as one of the members said, "They went down just like clay pigeons, losses were so heavy," the name the 367th had acquired stuck, and by the end of the year 1942 the squadron, in truth, appeared to be living up to it. It seemed for a time that no one could possibly stay in combat in that squadron and survive. Losses were heavier than those of any other squadron in the European Theater of Operations at that time, but the caliber of the work of the men behind the planes was evident in the comparatively few turn backs due to mechanical failure. Shoulder Sleeve Patches - 8th Army Air Force embroidered shoulder patches, 2½ inches in diameter. Hap Arnold Wings patch, the standard HQ Army Air Forces patch worn by most stateside personnel. The shoulder sleeve insignia worn by all personnel of the Army Air Forces (AAF) wherever stationed was approved on 23 February 1942. The patch was designed by Mr. James T. Rawls, an artist and a member of General Arnold's staff. He made many designs, most incorporating pilot wings, but Arnold rejected them all. Rawls, dejected by his lack of success, was shown a picture of British Prime Minister Winston Churchill giving his well-known "V for Victory" sign. Rawls made a quick sketch bending the wings up, and Arnold said, "That's just what I wanted." Arnold, incidentally, is said to have designed the first Air Force pilot wings in 1917 when he was a major. 8th Army Air Force shoulder sleeve patch. Double-scalloped design under wings. Some other styles are single-scalloped. See variations here. 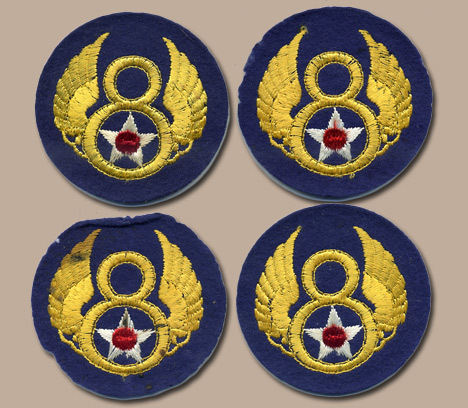 The Mighty Eighth Army Air Force began on 19 January 1942 and was activated on 28 January 1942 at the Chatham Armory in Savannah, Georgia. Located at Hunter Field, Colonel Asa N. Duncan was the first commander. Pearl Harbor had just been bombed about a month and a half earlier. Brigadier General Ira C. Eaker took the Eighth Air Force Bomber Command Headquarters to England the next month and located at High Wycombe, about 40 miles west of London and on the road to Oxford. In May 1942 Command of the 8th Air Force was assumed by Major General Carl A. `Tooey' Spaatz. He established the 8th Air Force Headquarters at Bushy Park (Teddington, Middlesex), 15 miles west southwest of the center of London on 25 June 1942. Shortly after the birth of the 8th AAF at Savannah, Joseph A. `Joe' Stenglein, 1st Lieutenant and pilot, in the 8th Bomber Command was on the way to the United Kingdom and in charge of 1,000 officers and men making the transition from Georgia into the United Kingdom as staff for the 8th Air Force. Joe knew the High Wycombe Abbey well as the main Headquarters building of the 8th AAF. Joe served at the Widewing headquarters in the London area and then became Commanding Officer of the organization which was to become the 25th Bomb Group at Watton, north of London. General James H. Doolittle assumed command of the 8th AAF on 6 January 1944.